The Uganda Vision 2040 notes the need to transform the country to a competitive middle income country with per capita of USD 9,500. This requires a drastic approach to improve the competitiveness of the country. 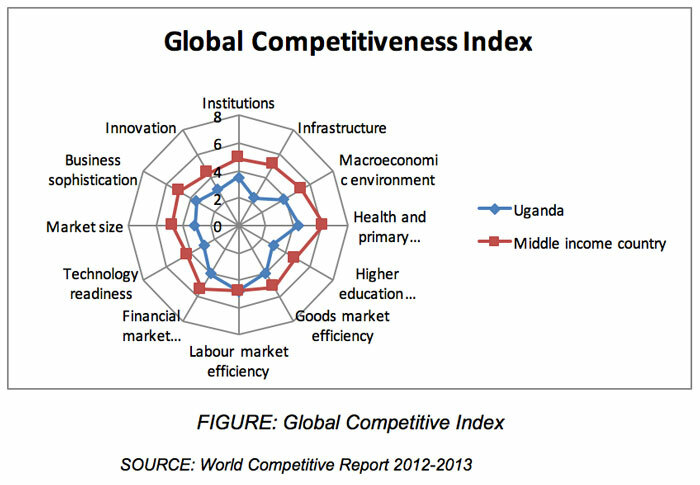 The Global Competitiveness Report 2012-2013 indicates that infrastructure is one of the biggest challenges to the development of Uganda. The report notes that for factor-driven economies (GDP per capita less than USD 2,000), infrastructure is pillar number 2 and critical for competitiveness. In Uganda, it is the lowest among the four basic requirements of competitiveness that contribute over 60% of the total competitiveness factors. As indicated in FIGURE 3 below, infrastructure has over the past years continued to constrain both the export and import sectors in Uganda and has made the country’s level of competitiveness very low. Lack of affordable transport to the sea has limited Uganda’s exports to neighbouring countries like Kenya, South Sudan, and Rwanda where there is connectivity by road. The high cost and the slow transportation of goods from the coast to Kampala has highly impacted on the Ugandan economy and slowed its socio-economic transformation. The average cost of freight transportation from the coast to Kampala is about USD 0.16 per tonne-km which is five times higher than the world average of about USD 0.03 per tonne-km (for railway transport which is suited for long distance and bulk cargo transportation). Considering that about 14.5 million tonnes of were transported on the Mombasa-Kampala route by road in 2013, the economy lost about USD 1.5 billion as the difference between the current cost of freight transportation by road and the world average cost of freight transportation by rail. This severely impacts on the competitiveness of Uganda’s economy. The high transportation of goods from different parts of the country to Kampala has also adversely impacted on the economy. The percentage of transport costs to the total cost of products in agriculture is estimated at about 60-70%. The transport margins for industrial goods are equally high with estimates ranging between 40-50%. These high transportation costs are mainly due to use of motor vehicles for long distances instead of rail. As a result, the economy is estimated to lose over USD 530 million in transportation costs annually. According to a recent economic evaluation study (UNRA, 2008), it is estimated that over 13.3% of the road life (two years of design life) is lost as a result of transporting heavy cargo on roads in Uganda. Over the length of the proposed SGR network (1,724km), it is estimated that over USD 200 million is lost annually in road deterioration. The same study also notes that the truck-km travelled would reduce significantly thus reducing the vehicle operating costs. It is estimated that over USD 640 million per annum would be saved if the SGR was constructed and most of the cargo shifted to rail. In 2012, the port of Mombasa handled 21.9 million tonnes of freight. This figure is projected to grow at a rate of at least 7% per annum to reach nearly 70 million tonnes by 2030 and 136 million tonnes by 2040. Even with substantial rehabilitation and upgrading, the capacity of the existing Mombasa-Kampala MGR cannot exceed 10 million tonnes per annum.The existing MGR was designed for an axle loading of only 15 tonne, a very low maximum freight speed of 35 mph (56 kph), very tight curves and steep gradients. Therefore, if a substantial portion of the projected Mombasa Port freight is to be evacuated by rail, it is absolutely necessary that a new high capacity railway line is constructed between Mombasa and the inland markets and production centres of the Northern Corridor countries of Kenya, Uganda, Rwanda, Burundi, Eastern DR Congo and Southern Sudan. Increased usage of the rail mode will be imperative if the costs of doing business are to be reduced to a level that would make the Northern Corridor countries internationally competitive. The recent developments in Southern Sudan have given rise to a dramatic increase in transportation demand, especially for bulk commodities for which the rail mode is best suited. South Sudan is well endowed with minerals including oil and iron ore among others. Also a lot of importation will be done (cement, steel. etc.) to build the infrastructure in this new country. With Port Sudan nearly 3,000 km away, most of the South Sudan import/export traffic is handled at the Indian Ocean port of Mombasa via the much shorter 2,000 km route through Uganda. In its current construction and condition, the Tororo-Pakwach railway line cannot safely and reliably carry a significant portion of this export/import traffic. Thus, much of it is carried by trucks, which leads to faster deterioration of roads. The location of Mombasa as the busiest port on the Indian Ocean coast and its proximity to the main maritime shipping routes through Bab el Mandala, the Suez Canal makes the SGR project most viable for Uganda, Rwanda, Burundi, Eastern DR Congo and South Sudan. 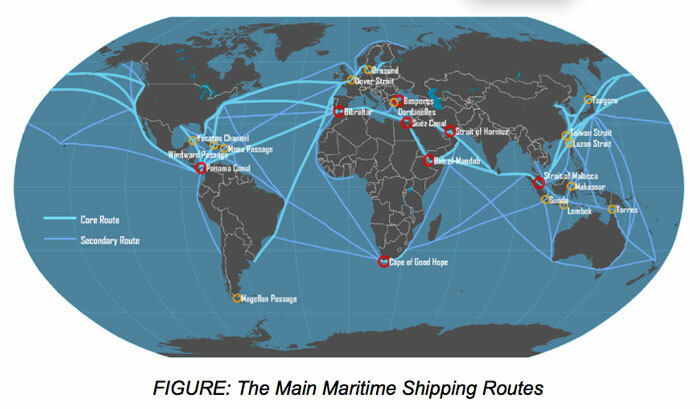 The main maritime shipping routes (FIGURE 4) provide an opportunity for these countries to export to Asia, Europe and the Americas. As such, Rwanda and Burundi have joined the Uganda-Kenya SGR project with the ambition to extend the SGR to Kigali and Bujumbura respectively. The recent discovery of substantial quantities of oil in the Bunyoro region of Western Uganda is also expected to give rise to increased economic activity in the hinterland of both the Tororo-Pakwach and Kampala-Kasese railway corridors. The Government is fast-tracking the start of commercial oil production. There are over 27 minerals in Uganda including iron ore (80 million tonnes), phosphates (200 million tonnes), beryllium, chromium, copper/cobalt among others that cannot be exploited economically without efficient rail transportation. The SGR in Uganda will also provide access to the rich vast minerals of DR Congo which include iron ore (5 billion tonnes), aluminium and large deposits of copper in Katanga region (62 million tonnes). There is also tin, lead and zinc (4 million tonnes), nickel, timber and oil and gas among others. The proposed SGR in Uganda will act as transit route for the minerals since it will be easier and shorter to reach the markets of China, India, Europe and the Americas. Currently, the total freight transit traffic from the Indian Ocean Port of Mombasa through Uganda to Rwanda, Burundi and DR Congo is of the order of 650,000 tonnes per annum. This traffic is expected to increase drastically (more than 20 times) tonnes by 2040. More export traffic than import traffic is expected as the peace and stability return to Eastern DR Congo allowing increased exploitation of her vast resources. Without an efficient railway, the roads leading to these countries will not be able to economically sustain the expected volume of freight traffic. At this stage of development, Uganda needs to develop heavy industries and infrastructure that will require transportation of heavy equipment/machinery and bulk inputs from the developed countries. The logistical challenges faced by oil companies in the Albertine Graben shows the magnitude of this challenge. Furthermore, it is an opportune time to tap from the advantages arising from the increasing labour costs in China and the need to relocate some heavy industries to Africa (geese approach). But this cannot be easily done if the investors are unable efficiently and cheaply export their products to the wider and lucrative markets of Europe and the Americas. Given the current trade imbalance with an import-export ratio of 1:6, it is imperative that the railway transport to the sea is eased. 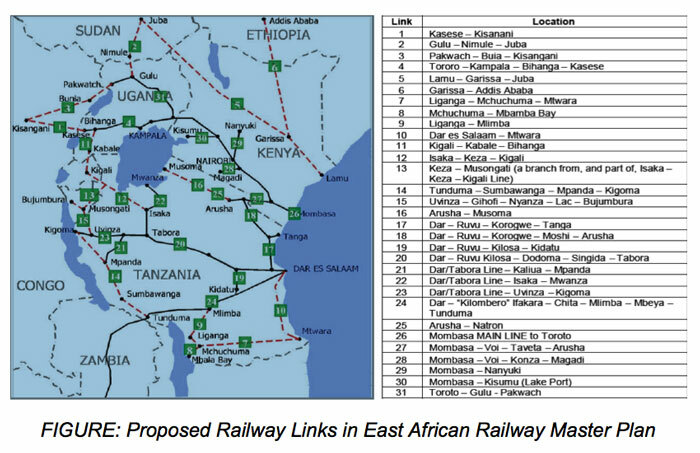 The East Africa Railway Master Plan Study (2009) notes the need to interconnect East Africa with a railway network to support its economic growth by reducing the cost of doing business. The proposal to develop an SGR network is consistent with the recommendations of the East African Railway Master Plan to link various capitals to foster faster integration in addition to the other benefits. 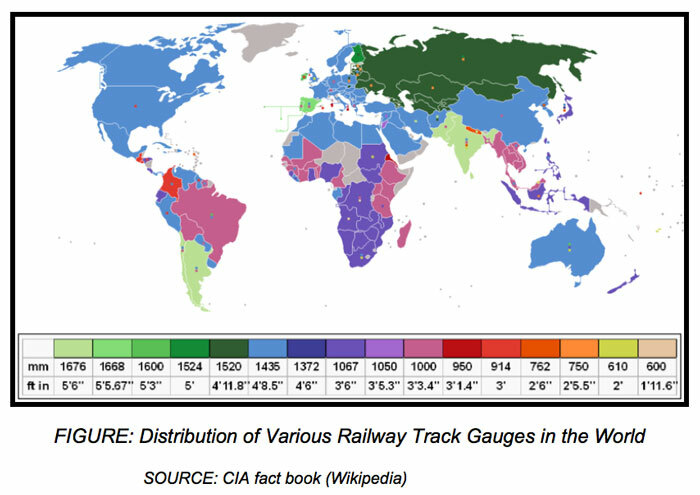 Since 1846, the standard railway track gauge (1,435mm) has been adopted as the international standard. Since then (for 170 years), standard gauge has been the most widely used railway track gauge in the world. Approximately 60% (in total about 720,000 km) of the world's existing railway lines are built to this gauge. The UAR framework has advocated for standard gauge to connect Africa to the world and this is in line with the greater Africa railway system.